propagate out to help other drivers find a way around. 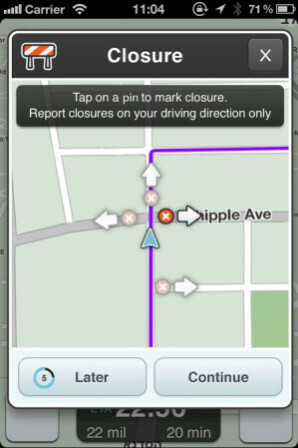 Waze's claim to fame is its ability to use instant crowd-sourced information to help guide people around traffic jams, and the new feature to let users submit road closings was apparently inspired by the Waze team's work with FEMA during Hurricane Sandy. Drivers used Waze to find open gas stations, which were few and far between, and FEMA used the service to know the best way to route fuel trucks. Waze's vice president of platform, Di-Ann Eisnor said, "Our roads are changing all the time, and Waze has been building the capability to take care of that." With that in mind, users can now alert others if roads are closed for construction, parades, or whatever the reason. 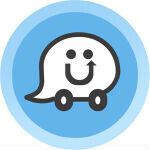 If you want to try out Waze, it's available for free for iOS and Android. One of the best apps in any platform. Time for me to dumb Garmin. Such a wonderful invention. The only thing is that it uses my battery life and heats up my phone like crazy!